The Fleet Navigator suite of solutions is comprised of user-friendly systems designed from the hose back to the office, not the other way around. Fleet Navigator puts a focus on one of your most valuable assets, the driver. 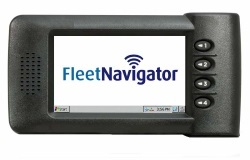 Fleet Navigator is user-friendly and requires little to no training to operate. Fleet Navigator works with most electronic truck registers, even mixed fleets. Fleet Navigator easily integrates with most back-office accounting software. 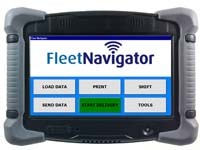 Fleet Navigator runs on a variety of hardware platforms and integrates with most electronic registers. Fleet Navigator is committed to keep ahead of the technology curve, as new registers are developed we will have the ability to interface with them. For fleet fueling and single tank deliveries the Fleet Navigator software can be loaded onto a handheld scanner running on a Windows operating system. This easy to use system is packed with features and works with durable yet inexpensive barcodes. Fleet Navigator picks up where other systems leave off, allowing the fueler to record valuable information like hour meter, hub meter and odometer readings. This feature allows you to schedule important vehicle and equipment maintenance that prevents down time. Fleet Navigator offers software packages that will help you sort out all the data that comes in from the fuel truck. We also offer custom software to meet all your specific needs. The information stored on the handheld can be uploaded into your office data system via a docking cradle or it can be transferred using wireless technology. This flexible solution is being used by companies of all sizes, from some of the largest fleet fuelers in the northeast to the smaller one or two truck operations and everywhere in between. Stop by booth 709 and we can show you how Fleet Navigator can meet your fleet, wet hosing and on-site fueling needs. For single tank deliveries the Fleet Navigator software can be loaded onto many touch screen fixed mount Windows CE based solutions. Fleet Navigator software automates and captures the delivery transactions. It is mounted inside the cab of the truck and directly connects to the register. The Fleet Navigator software allows the driver to control the register via this connection. 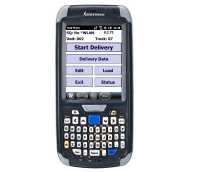 In addition to the register control, Fleet Navigator electronically captures the delivery record. This includes data such as time, date, sale number, truck number, totalizer, quantity delivered in gross and net if compensated. One of the best features of Fleet Navigator is the flexibility to work with existing office systems. Fleet Navigator can produce an output file as simple as Excel-friendly comma delimited text file or as complex as full data exchange to and from the office. Fleet Navigator does not require changes in the office software in order to take full advantage of all the features Fleet Navigator has to offer. There are a number of mechanisms that can be used to get data to and from Fleet Navigator to your office system: USB thumb drive; Wi-Fi; or cellular. Rush Business Solutions is only an email or phone call away. Please do not hesitate to give us a call or send us a quick note. It would be our pleasure to answer any of your questions.